At the ports of Los Angeles and Long Beach in Southern California, GE Transportation is expanding a pilot project that links data on shipments to port operators and rail and truck freight carriers and helps each of the parties to move cargo more efficiently. Since launching a pilot at the Port of Los Angeles in 2017, users of GE’s Port Optimizer software have seen a 12% increase in overall efficiency based on a combination of performance metrics, including quicker turn times for trucks coming into and out of the ports, a reduction in average dwell time for empty containers and improved scheduling of trains to carry goods away from the ports, according to GE Transportation officials. “We’ve seen tangible results,” said David Casey, senior director of port solutions at GE Transportation. Instead of being forced to react to changes in shipping volume on a day-by-day basis, GE’s software connects users to a common platform where they can see, and prepare for, shipments up to two weeks in advance. Having such information allows motor carriers more time to line up capacity and railroads to get better utilization of trains, Casey explains. Based on results from the pilot project, the use of GE’s Port Optimizer is being expanded to all port terminals in Los Angeles and three of six terminals in Long Beach. Another initiative aimed at improving the flow of ocean freight through the use of blockchain technology was launched in January by the Danish shipping firm A.P. Moller-Maersk and U.S.-based technology firm IBM. 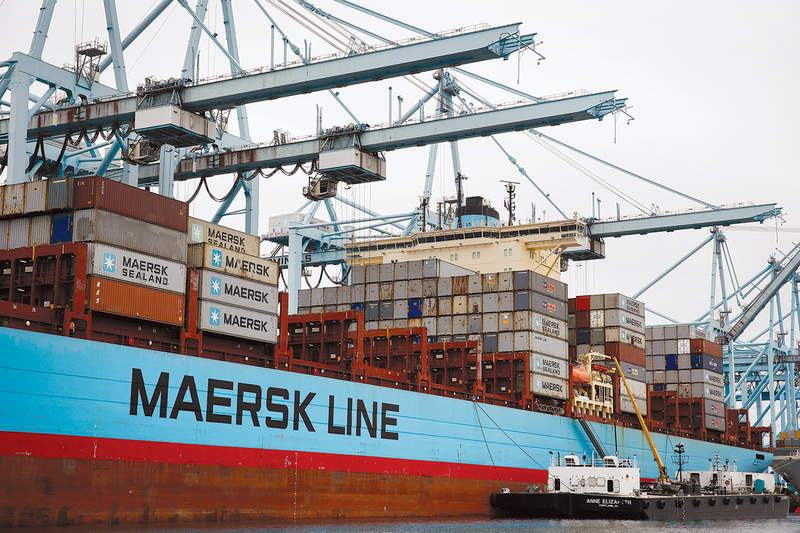 More than 20 port and terminal operators have agreed to participate in a digital platform called ­TradeLens created by Maersk and IBM to capture shipping information, including arrival times of vessels, customs releases, commercial invoices and bills of lading. Also agreeing to participate in what will be a 12-month trial run of the data-sharing program are shippers, ocean freight carriers, freight forwarders, inland transportation and customs authorities, officials said. Advocates for such a system say it could dramatically reduce the amount of paperwork involved in handling international shipments, reducing costs and improving the ability of port operators to add value to customers. One of those testing the concept is Thomas Holt III, business development manager for Holt Logistics, a company that operates the Packer Avenue Marine Terminal in Philadelphia. The U.S. Department of Transportation also is targeting inland ports for infrastructure improvements. In August, Transportation Secretary Elaine Chao announced $4.8 million in grants for marine transportation projects in the United States, including $2.5 million for the Port of Baton Rouge and Port of New Orleans to purchase new terminal handling equipment for loading and unloading of containers on barges. In the Northeast, Quonset Development Corp. received funds to offer a container-on-barge service between Brooklyn, N.Y.; Newark, N.J., and the Port of Davisville in Rhode Island. The new service is expected to take 83,200 containers off the road and relieve congestion in the Port of New York and New Jersey. Other projects receiving grants include expansion at the Richmond Marine Terminal in Virginia, a ­ferry service across the Long Island Sound between New York and Connecticut and a container-on-barge demonstration project proposed by the Paducah-McCracken County Riverport Authority in Kentucky. Along the U.S. Gulf Coast, port operators are preparing for a surge in production of chemicals and increases in fuel exports. In August, Contanda Terminals (formerly Westway Terminals) announced plans to build a third large-capacity storage terminal on its property along the Houston ship channel. The new terminal will provide up to 3 million barrels of petrochemical and hydrocarbon storage capacity, a deepwater ship dock, and two barge docks along with truck and rail connections when com­pleted in 2019. “This project meets the growing needs of our customers who have requested additional storage and logistics services to support their growth initiatives,” said Jerry ­Cardillo, president of Contanda in Houston. Looking ahead, Contanda plans to develop another 350-acre site along the Houston ship channel to further expand storage capacity. The two projects together will more than double Contanda’s storage capacity over the next five years.